The high-quality stainless steel blades enhance color mixing and resist wear and corrosion. Ergonomic wooden handles fit comfortably in the hand. 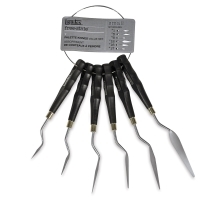 These are the perfect tools for Liquitex and other heavy body acrylics. Note — Please see "item specs" tab for knife measurement information. Ring Set of 4 Large — This handy ring holds #2, #6, #11, and #13 Large painting knives. Ring Set of 6 Small — This set includes #1, #5, #6, #12, #16, and #17 Small palette knives on a ring. The height is the knife and the handle together. The width is the width of the actual knife. The depth is how deep the angle goes from the handle to the knife.